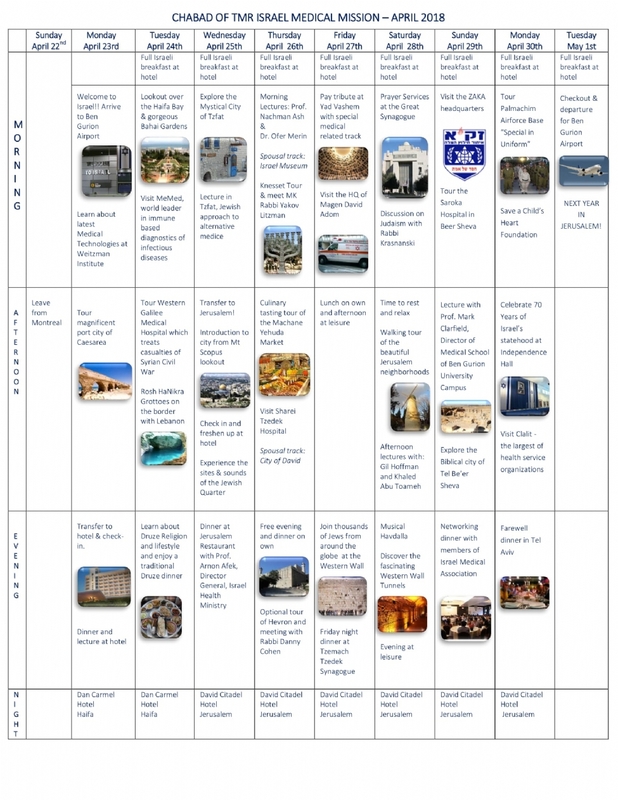 Click on the thumbnail to download a printable version of the Summarized Trip Itinerary. *Offering second track for spouses of touring and activities while CME programs occur. 9:30 AM - SPOUSAL TRACK - Explore the Israel Museum including the Dead Sea Scrolls, Model of Jerusalem, Sculpture Garden & more. 8:00 AM - ZAKA Headquarters - A voluntary humanitarian response team responsible for the recovery and identification of body parts when tragedy hits. 16:00 PM - Explore the Biblical city of Tel Be’er Sheva, an archeological site in southern Israel believed to be the remains of the biblical town of Beersheba. 19:30 PM - Dinner with Canadian Ambassador and Israel update with Avi Melamed, Middle East Strategic Intelligence Analyst and former Israeli Intelligence Official and Senior Official on Arab Affairs. 8:45 AM - Tour Palmachim Airforce Base with commanders & troops, and meet soldiers from the “special in uniform” special needs unit. 12:00 PM - Visit the Save a Child’s Heart Foundation, an Israeli based organization that provides pediatric heart surgery and care for children from developing countries. ** Please note that the itinerary is not final and is subject to change based on time, weather, security and other considerations.